To say that I loved Dr. Datis Kharrazian’s books Why Do I Still Have Thyroid Symptoms? When My Lab Tests Are Normal and Why Isn’t My Brain Working? would be an understatement. The truth is they blew my mind. Dr. Kharrazian’s interview with the founder of the Gluten Free School Jennifer Fugo is a must-read. Jennifer: Welcome to the Gluten Free School Podcast. I’m your host, Jennifer Fugo. Today, we are going to talk about your brain, thyroid, and all sorts of issues around gluten. I have Dr. Datis Kharrazian with me and I would love for him to share with us all about his experience. He’s an author, a very well-respected author of two different books, Why Isn’t My Brain Working? and he’s also got another book, which is excellent called Why Do I Still Have Thyroid Symptoms When My Lab Tests are Normal? He is one of the most sought-after educators and clinicians in natural medicine, laboratory analysis, and nutrition. He’s involved with so many different universities. He’s on the educational board of the Journal for Functional Neurology, Rehabilitation and Ergonomics. He’s an adjunct faculty member for the Bastyr University, California. He teaches continuing education at the University of Bridgeport and actually teaches curriculum for the functional medicine program at Loma Linda University School of Medicine. I’m really appreciative to have him join us today. So welcome, Datis. Datis: Well, thank you so much. It’s a pleasure to be here. Jennifer: So can you give everybody a little bit of a background of yourself and how you ended up becoming so interested in these topics that you write about? Datis: Well, for me, I started my career going into chiropractic school. I had a back injury in high school. I got helped by a chiropractor and I wanted to do that. And then when I got into practice, I really had a lot of chronic patients that had many different types of metabolic and inflammatory conditions. Many of these patients became close friends. They basically would just tell me, “I have nowhere to go. I need you to help me. Tell me what I need to do.” It really, really put the emphasis on me trying to figure out what I can do to help my patients. My practice soon evolved into more of what we call a functional medicine practice where we’re trying to look at dietary, nutritional, metabolic factors and try to see how we can do things to help people. That really was where it all started. There was a need I had in my patient population and I had a desire to help them. From that, I went to get a masters in nutrition and then I got my practical science, so I can understand research better. And then I got into a position where I was writing some papers and I got asked to start doing seminars and lecturing. Before I knew it, I was teaching 80-100 events a year in different conferences all over the world. I was put in a position where I had to constantly read all the latest research. And then since I was doing so many seminars to help the professionals (we get so many chronic patient referrals), that put me on a spot where I clinically needed to really figure out what to do with them and just being stuck in an environment where I had difficult patients referred to me and having to speak about the latest research. It really put me in an environment where I had to blend what was clinically relevant and what I could pick up on reading journal papers and making those applications. Over the past 15 years, that’s what I’ve been teaching to practitioners. Just recently, I started to actually share my information with the public through my two books. And now I’m on my way to share as much as I can with the public directly instead of just through lectures with healthcare professionals. Jennifer: So what drove you to start off with the thyroid issues. I’m curious because this is how I found you. Many people had suggested that I check out your thyroid book. What made you begin there as far as writing? Datis: Well, for me, I don’t really have a passion for the thyroid to be totally honest with you. It was just because that’s what so many patients had. Patients would come into my office chronically ill and they would be diagnosed hypothyroid. 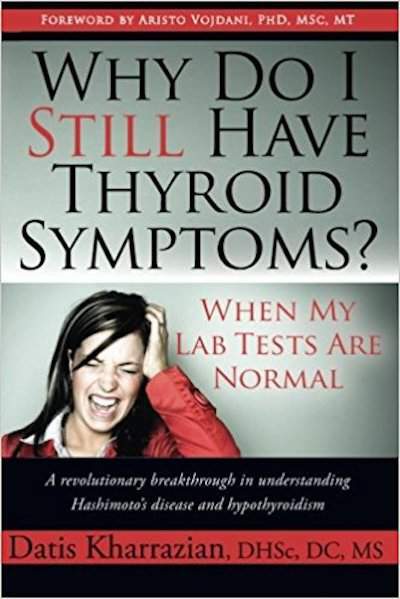 And prior to my book being published in 2009, anything you would read about the thyroid was really pretty much ‘you take iodine, you take tyrosine, you avoid goitrogenic foods’. When I was working with my patients, that model just didn’t work. When you look at the literature and you really read about the mechanisms of hypothyroidism, more than 90% are really autoimmune Hashimoto’s. There was just so much information and literature about Hashimoto’s and things associated with Celiac and gluten-intolerances and there’s so many nutritional things we can do with autoimmunity. So the first book, Why Do I Still Have Thyroid Symptoms? When My Lab Tests Are Normal , was really a hope to try to get the public and healthcare practitioners to stop fixating about single nutrients like iodine to fix a thyroid problem and really look at the mechanisms with autoimmunity. And as far as the connection to gluten, there’s just no question that many people that have Hashimoto’s and hypothyroidism have gluten-sensitivity. For some patients, it’s life-changing when they go gluten-free. So that’s really kind of where it all started. Obviously, there’s more, more things that need to be done besides being gluten-free if you have Hashimoto’s, but that is really one of the earliest, most impactful steps a person can take if they have a thyroid disorder. Jennifer: And may I ask you, what about gluten exactly that causes the issues for the thyroid? A lot of people have asked that. What’s the connection? Datis: Well, here’s the thing. We know that if you look at most of the research that’s done, it’s really correlational studies. When they see people that have Celiac Disease have Hashimoto’s and people that have Hashimoto’s end up having Celiac Disease, what’s in the literature is really mostly correlational studies, comparing one group to another group and the high association with them. There are some people that believe that there’s what they call ‘molecular mimicry’, that the protein structure of TPO and even various thyroid proteins are similar to gluten and that when one person makes antibodies against gluten, they also make antibodies to other proteins that are very similar. That cross-reactivity model has really been proven for neurological tissue, but not so much yet for thyroid disorders. Now we’ve just published a paper earlier this year in the journal called Nutrients. It’s open access. So if you do a search for my last name, K-H-A-R-R-A-Z-I-A-N, you’ll see the paper we published. We took 400 people that were healthy blood donors and we found that with a healthy population, we had about 20% that are showing gluten sensitivity and a third of those people had neurological antibodies. And then we did some further testing and found that a third of that group really had cross-reactivity as the model. Right now, we’re doing research in the lab. We’ve taken 180 of the most common foods. We’ve purified the proteins and we made monoclonal antibodies to actual TPO (the enzyme that makes thyroid hormones, thyroglobulin), actual T3, thyroid hormone T4 and an enzyme that could reach T4 and T3, which may help in finding which foods cross-react with it. Hopefully, we’ll get this information published in the near future. But one of the things that we know is that gluten is most likely one of these proteins, but it’s not the only protein. The most likely thing that we see is that there’s this so-called cross-reactivity, also known as molecular mimicry between the immune response to gluten and other types of proteins that are involved with thyroid function. Jennifer: And so I think what’s really fascinating here is that you’ve actually broken this down in a way that I haven’t seen elsewhere. I think that the thyroid issue is a big problem and a lot of people aren’t really certain if going gluten-free simply because they have a thyroid disease is enough to warrant going gluten-free. And so in reality, it may not just be gluten. What you’re saying is it may be a number of other proteins that we’re consuming that are somehow triggering this autoimmune reaction? Datis: Yeah, exactly. So we know that, for example, gluten is without question a trigger. And we know for sure that Celiac Disease is really where most of the research is, but there’s no research really showing that it’s really just a gluten-sensitivity, that it doesn’t have to be the hard criteria of Celiac Disease with a specific genotype and biopsy. Just any kind of gluten sensitivity itself can do it. But even within the literature right now (and I talk about this in my Brain Book), we talk about that there are certain studies that had been published that show that gluten can also cross-react because of the protein similarity to dairy protein. So that’s why many people don’t really feel better until they get gluten-free as well as dairy-free. And then also, what’s been published in the literature, there are certain proteins, for example like sesame and rice, even corn, these are so close to the structure of gluten that we see this cross-reactivity. So in the real clinical setting, what we typically find is some people really just don’t necessarily notice a big difference when going gluten-free and then they kind of dismiss the whole thing. The problem is if you look at their labs, they have very, very high levels for gluten-sensitivity and their thyroid autoimmunity is really mauled. If you look at their immune responses like T-cell and B-cell counts and antibodies, it’s really very, very active. Even if they may not notice it, when they go gluten-free, those things go down. But also, some of them don’t really get better because they’re gluten-free, but they’re still eating dairy or they go from being gluten-free to being the best gluten-free chef in the world and how they can do everything with tapioca and corn, all these other things. They still may be cross-reacting to those. So we typically see a lot of people just avoiding grains altogether really seems to have the biggest impact. The research we’re doing in the lab right now, we’re trying to see, there’s probably other proteins even within the Paleo diet that can be directly cross-reacting with variations of thyroid function. I really think when we get that information published, it’s going to really be a breakthrough in how diet continually impacts thyroid function. Right now, most of the research has been on gluten, but we know that it’s probably, just definitely more than that. Actually, that’s what we clinically see. And without question, grain-free seems to be the best model that we see patients have an outcome with. Jennifer: And so moving from thyroid to your brain. A lot of people struggle. Especially women, we tend to struggle (or at least acknowledging that we struggle) with depression, the difficulty to function or to feel present and focused. There’s a lot of brain fog. You just feel like your brain is broken. Have you found any connection between the thyroid functionality and the brain? One of the things that I do in my practice is I screen for all the major tissues and look for antibodies. One of the single most common areas we find antibodies against is cerebellum tissue. The cerebellum is a part of the brain that is involved with multiple functions. The interesting thing about it is (now there’s papers published on this) that gluten directly cross-reacts with cerebellar tissue. It really causes the brain to degenerate. And when the cerebellum starts to degenerate, people start to get more sea-sickness and car sickness. They can’t handle any kind of visual stimulus. They can’t handle flashes of light. Their balance becomes compromised. The whole brain function really just becomes compromised. But unfortunately, when people get diagnosed with the label of being hypothyroid and whether their practitioner still holds on to that diagnosis and label for every single symptom they have what the patient does, many people that have hypothyroidism really have gluten-sensitivity. Over time, they actually have significant brain degeneration. When people degenerate their brain, one of the first things they get is depression. And so the depression they may have, being part of this vicious cycle, really may be more brain-based than trying to find the perfect thyroid hormone replacement or the dose. 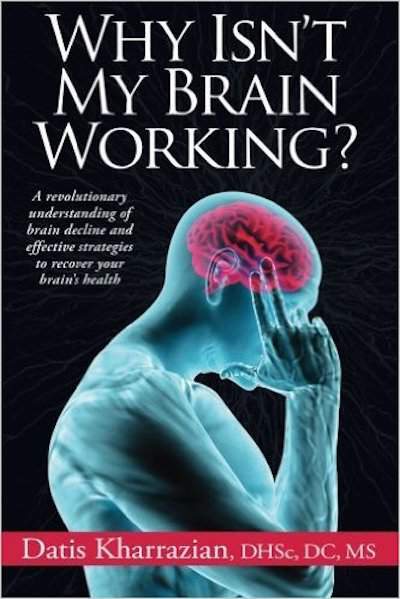 Many people that have brain degeneration also will have fatigue especially when they use their brains. When they try to read, they fatigue quickly, if they try to drive. These are all important brain function. And if they try to use their brain, since their brain is not healthy, they fatigue really quickly. Many times, these patients have depression and fatigue and since they’ve been labeled thyroid, the focus is on thyroid and no one really does anything to support the brain. 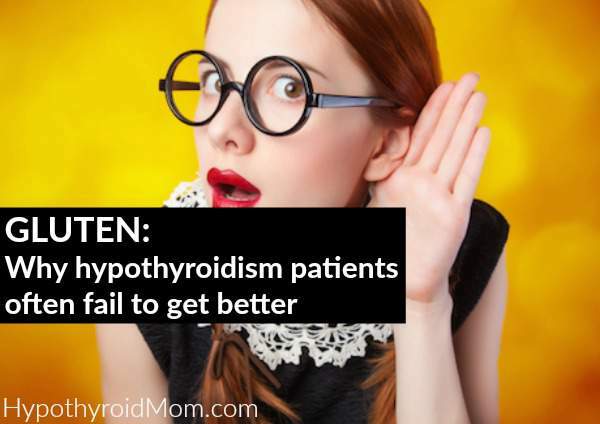 So I really always say to the thyroid patient in the cases I see with long-lasting hypothyroidism where people have become chronically compromised, there’s almost always a brain component to it. It was a way to really try to get people to really understand that perspective. Unfortunately, in the real world, a lot of people have hypothyroidism and their biggest focus is just their physical appearance. They worry about their weight and metabolism and their hair loss and those things, which are also important (they need to be addressed), but they tend to completely ignore the fact that they may have accelerated brain degeneration, which will really devastate their life. It will catch up with them if they don’t address them. This becomes a really critical thing to look at. Jennifer: If say you’ve already started to develop the thyroid issues and now you’re noticing as someone is listening to us talk and they’re saying, “Oh, my gosh! I have a lot of these issues with my brain. I feel like it’s just not working.” Is this a lost cause? Is there any way to repair this and to reverse – I guess you’d call it damage that’s been done? Datis: It’s definitely not a lost cause, but it’s also something that needs to be taken very seriously very quickly because first of all, brain tissue, neurons or what they call post-mytotic tissue, these are cells that can never go through cell division again. We only have two tissues in our body that can never go through cell division again, your brain and your heart tissue. If you look at your skin, your liver, you kidneys, your muscles…every several weeks, your cells die off and you make new ones, but you never make new neurons of the brain and you never make new heart cells. You’re only born with a certain amount and that’s what you have for the rest of your life. So yes, there is a sense of urgency that if you have gluten-sensitivity and it’s impacting your brain function (or hypothyroidism, which is a mechanism that cause accelerated brain degeneration) and you don’t really start to address those, yes, this can be really, really scary and devastating. But the only thing that gives a little bit of comfort is the brain is highly plastic, meaning that even if neurons die, if the existing neurons can branch and connect with each other, then function can return. So despite the scary things about neurons permanently dying and there’s only an x amount of neurons we have, at least we have some hope where we can develop plasticity and get these neurons to connect with each other. But there has to be specific strategies employed for the brain. You’re not just going to take thyroid hormones and just fix that scenario with the impact on the brain. You really need to do direct interventions for the brain when there’s nutritional things or whether it’s trying to do rehabilitation for the brain to make a difference. For most people that I see in my practice, working with chronic people that have long-lasting hypothyroidism, the ones that really just had their life taken away from them where they can’t really do daily functions anymore, there’s almost always underlying brain component to it. Unfortunately, in conventional medicine, if it doesn’t show up on an MRI and it’s not like Parkinson’s, it gets totally ignored. And also, in alternative medicine, we just don’t have people that really focus on the brain. They have a very limited model. Maybe give them things like fish oils and maybe some natural anti-depressants and that’s really it. So what I tried to really cover in my book Why Isn’t My Brain Working? was really an exhaustive, complete model to really show all the different ways we can really support the brain. Jennifer: So aside from taking gluten out of your diet (and it sounds like also, you would recommend people take dairy out as well), what other foods? Are there any other specific foods that people should consider either eliminating or even just limiting? Datis: When you look at the food component (and we’re not getting into supplements, but just food as medicine), there’s the aspect of gluten and dairy – dairy being the most cross-reactive food. But when we talk about these conditions with thyroid especially, these are mostly autoimmune reactions. So we do consider foods that are highly immune reactive like GMO’s, like soy and corn being an issue. The other cross-reactive foods like sesame and rice can be an issue. So those are for sure taken off the list. But the other key component that people just tend to always ignore is blood sugar stability. Blood sugar stability has a profound impact on autoimmune reactions and our brain. Now when I say blood sugar stability, I don’t mean just picking the right foods, but how frequently you eat foods. So one of the biggest problems we see with a lot of chronic autoimmune Hashimoto’s, hypothyroid people or chronic brain people is we see a mix of them being low blood sugar people, a mix of them being pre-diabetic or high blood sugar people. They have blood sugar issues. The people that have low blood sugar are the ones that get shaky, light-headed, irritable. They crash in the afternoon. They forget to eat. They miss meals. And usually with them, they have healthy food choices. So when you look at their food choices, they may be gluten-free or even paleo, but they skip breakfast. They’d have an apple or some fruit for breakfast. They really don’t have substantial protein frequently enough and their blood sugar levels drop. Now when blood sugar levels drop, that turns on a whole cascade of reactions with cortisol and with insulin surges. These things have degenerative aspects on the brain and they also trigger autoimmune responses because when your blood sugar levels drops, you release something called interleukin-6 to activate the hypothalamic pituitary adrenal access. But that interleukin-6 activates TH17 cells, which then promote autoimmunity. So just talking about food, it’s not just the food choices people have, but how they stabilize their blood sugar. One of the biggest things we see is people sometimes have done the elimination with dietary protein triggers such as gluten or dairy and other types of cross-reactive foods, but they still have the difficulty to stabilize their blood sugar and they don’t know why they don’t feel better. So a lot of times, we’ll just see a chronic person who’s already done their dietary food restrictions just learn how to stabilize their blood sugar levels and they have a profound impact in how they feel and their energy levels throughout the day. So yes, diet and diet. It’s not always food restriction, but it’s also blood sugar stability. Jennifer: So what you were saying (because I want to be very clear about this because I think that’s really a very important point) is that your blood sugar stability is directly related to good, healthy thyroid function as well as healthy brain function. Datis: Yes, absolutely. And this a scenario people will typically ignore. They kind of look at a blood test and just see if someone has diabetes or some insulin resistance. If they don’t have those, they ignore it. So here’s the key thing. If you’re a listener and you want to know if you have a blood sugar problem, what you should first notice is how you feel after you eat. A change in energy is always a sign of imbalance. If you have a normal functioning blood sugar system, the only thing that should happen is you should have, first of all, symptoms of being hungry (that’s a normal response) and then you should eat food and then your hunger symptoms should go away, but there should be no up’s and down of energy. People that have chronically low blood sugar, they’re the ones who, first of all, don’t have a noticeable loss of appetite that they’re hungry. They usually just feel, “Okay, my screen is getting blurred. I’m getting shaky. I’m getting cranky” and that’s kind of their clue to eat. And then when they eat, they have a significant change in their function. Those are all pre-indications that they have low blood sugar function throughout the day. People that are insulin-resistant that tend to have higher blood sugar levels throughout the day, they’re usually hungry all the time. The key thing with them is once they eat, they get really, really tired and they need things like coffee or cigarettes or some kind of stimulant to get them going again. So one of the things we always ask in the history with patients (and if you’re a listener, you can kind of see if you apply to some of these things) is how do you feel after you eat? If there’s no changes, up’s and down’s of your energy level, then your blood sugar system is probably intact. But if you feel a change like you feel like you’re functioning, recovering, then you’re probably on the low blood sugar side throughout the day and if you’re really tired after you eat, you’re probably on the high blood sugar side. And then there are some people that have mixed patterns of both. That is an ongoing trigger for accelerated brain degeneration, loss of brain function and it’s also a trigger for autoimmune responses, which can really be devastating for people if they don’t break that lifestyle pattern. Jennifer: Then those people who are eating very processed, packaged gluten-free products (which does happen, there are people out there who give me a lot of push-back because I do not advocate for eating lots of processed, refined, gluten-free, starches and grains), do you agree that they are just as much in danger of this whole blood sugar issues sliding into diabetes affecting their thyroid, affecting the brain? They’re still at risk for this too even though it’s gluten-free, right? Datis: Yeah. Actually, this is back to another point. Some people are really, really attached to food and they really just think, “Well, I can’t have cookies anymore” and they find gluten-free cookies or gluten-free pastas and they engage in those activities. They’re still getting significant insulin surges and those are still highly starch-refined foods. And to be quite honest with you, most of the gluten-free products are not really gluten-free. There’s still contamination in those products and it’s clearly listed on the label. So in my practice, I don’t really encourage people that are gluten-free to go to the gluten-free aisle and get all these things. I just really want them to be on an autoimmune type of lifestyle, which really has the factor of making sure they don’t get chronic insulin surges and those types of things as well. Obviously, you can have occasional exposure to those things, but not if you have ongoing blood sugar issues. So we’ll see sometimes people, the reason they don’t feel better on a gluten-free diet is because one of the key mechanisms why they’re still not functioning well is because they’re having chronic blood sugar surges and spikes. So if they just switched to gluten-free pasta and gluten-free cookies and gluten-free starch products, they’re still just going to feel lousy. Jennifer: I absolutely agree with you. I just wanted people to hear you and others — I’ve actually asked that question of many other guests who have come on this podcast. There are other people, physicians and researchers and teachers just like yourself who are seeing this in a real clinical setting and have the same concern. Now I’m really curious because you’ve brought up this idea that gluten can trigger autoimmune issues as obviously this issue with insulin spikes and such. What are some of the common gluten autoimmune diseases that you are familiar with? Datis: Well, the literature is really clearly showing that the majority of autoimmune reactions from gluten are brain-based, that they’re neurological. The area that’s showing the greatest impact is gluten causing cerebellar autoimmunity and cerebellum degeneration. The interesting thing about that is when you do laboratory testing for that, what most people test is what’s called transglutaminase 2, but that neurological brain response to gluten doesn’t show up unless you measure levels of transglutaminase 6. Transglutaminase 6 is the enzyme that is correlated with neurological demise. This is not part of the Celiac model. Some papers are showing that the response to gluten for two-thirds of people impacts the brain and has no gastrointestinal symptoms whatever. So without question, the biggest autoimmune reaction is really brain-based and specific cerebellum. Now in my office at just a small scale, for every single gluten-sensitive Celiac patient, we also check these multiple tissue antibodies. We check 25 tissue antibodies, everything from tropomyosin antibodies to osteocyte antibodies to adrenal antibodies, everything. There’s no question, the single most common thing that we see is first of all, neurological autoimmunity and the second most common thing that we see with gluten-sensitivity is autoimmunity related to diabetes, which they call type 2. Many researchers now are finding that many people that are actually diagnosed as type 2 (meaning they don’t need insulin yet), they actually have an autoimmune cause, which is type 1 and many people even in the conventional literature are throwing out these terms like type 1.5. Type 1 is technically insulin-dependent, which is autoimmune and type 2 is really considered to be non-autoimmune, but they’re finding so many people that have been diagnosed as type 2 that actually have type 1. They’re calling them these type 1.5. So whenever we see people that have diabetes or any kind of brain degenerative issues or even hypothyroidism, we really see a strong correlation with Celiac and gluten-sensitivity and vice versa. If we see gluten-sensitivity, we run antibody markers. We’ll see thyroid, brain, and pancreas relate to autoimmunity show up. Jennifer: Wow! That is something. You’re just totally blowing me away. This is great research that you are working on. Datis: Yeah, I’m just trying to get this information out to people as much as I can. I’m really in a unique position where I’m in a lab throughout the month and also, in the seminar circuit where I can speak to practitioners and then also my practice just working with patients. I’m constantly building my own literature searches in the spectrum. Being in that position and seeing all these different windows really helps me kind of connect these dots together. The goal for me is really just to try to get as much information out to the public and practitioners. At the end of the day, they go, “What do you want to do in life?” I want to finally say we can figure out what to do for this epidemic. The other day, I was in my office and I had a 9-year old show up with severe Hashimoto’s. I did an examination on her. She has severe neurological dysfunction and she had severe developmental delays. She had this improper diagnosed anemia. She’s been to so many specialist. I’m just looking at her and I had an 8-year old daughter, I just couldn’t help to feel a little bit sad and really, really emotional because she really has nowhere to go. We really don’t have enough people in both alternative and conventional healthcare to really address the physiology that we all know is being published in order to put all the stuff together. Jennifer: It is a huge problem that most people have to become their own advocate. I mean I think on some respects, I say a problem, but I think there’s a blessing in that we get very involved with our health. That’s a really important and wonderful thing, getting in the driver seat of what’s happening to you. I was disempowered in the fact that we don’t know what’s going wrong, we go to the doctor’s office and we expect someone else to tell us that either something is wrong or something isn’t wrong. The problem is (as in my own situation), I went and I was told, “We don’t know what’s wrong with you. We’re really not certain.” I’m left to figure it out for myself. That ultimately is the boat that many of us are in. We don’t know. That’s why I love your books and everything that you’re putting out there because you’re really giving people the tools and the information that’s missing. I love that you’re educating the clinicians that are seeing these people. So if someone wanted to get tested (and they’re not in your neck of the woods), do you have any suggestions of what type of testing they should look for when they go to a clinician or a practitioner? Datis: We know with the literature that many people have reactions to gluten that are not just the alpha gliadin connections. So if you look at gliadin, gliadin is really one branch of the gluten protein. And if you kind of look at the gluten protein as a tree, it has several branches. There’s alpha gliadin. There’s gamma gliadin. People can have reactions to the different portions of wheat. And we know there’s transglutaminase 2, there’s transglutaminase 3 and transglutaminase 6, two is really into the gut, three is really to the skin and six is really to the brain. There’s also reactions to opioids like gluteomorphin and prodynorphin. If we don’t test for the whole spectrum, we can many times miss gluten-sensitivity. If we know if someone has a transglutaminase 6, we know there’s going to be a brain component potential, if there’s transglutaminase 3, there’s going to be a skin component. And sometimes, people that have gluten-sensitivity, they don’t have the severe intestinal complaints, but they have skin reactions or they have brain reactions. Many times, a test with the alpha gliadin, most people don’t know that when they get tested for gluten, it just says gliadin antibodies. That’s only alpha gliadin. It’s not glutamine, it’s not the whole protein. When they get transglutaminates, they’re only getting tested for two. The labs don’t distinguish that on the reports. In my book Why Isn’t My Brain Working? I have a whole chapter written about all the different variations of gluten testing and I have over a thousand references. I reference all the research on what’s being published on this. And I think if you have gluten sensitivity, especially if we have shown to have any reaction, you may need to get a complete gluten reactivity profile where all the branches and all the different transglutaminase are tested instead of isolated ones that are typically only done because they have some association with the whole conventional pure Celiac Disease model. Jennifer: Thank you so, so much. I think you’ve connected a lot of pieces and answered a lot of questions that people have asked me over the past year about thyroid issues and at least giving them the tools to start looking deeper. Datis: Thank you, Jennifer. I appreciate it. Jennifer Fugo is the founder of Gluten Free School, a website dedicated to teaching gluten-sensitive individuals simple, savvy and empowering steps to get healthy. She’s a certified Health Coach named a “Gluten Free Guru” by Philadelphia Magazine. Jennifer is a sought-after expert about healthy, gluten-free living as well as a speaker who has been featured on Doctor Oz, Yahoo! News, eHow, CNN, and Huffington Post. Jennifer wrote the book The Savvy Gluten-Free Shopper: How to Eat Healthy Without Breaking the Bank .